What’s going on with the Silver Line traffic signal on D Street? A Silver Line bus crossed D Street as it traveled along Silver Line Way. Officials have tweaked the light cycle here after motorists’ complaints. 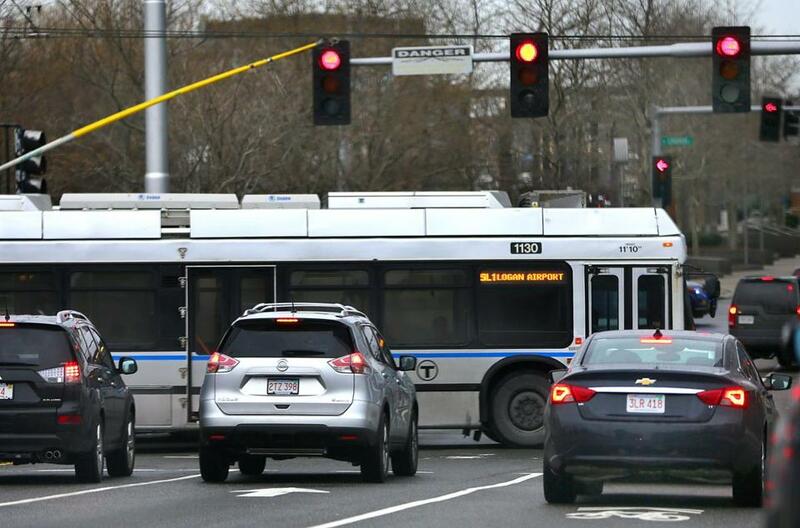 The traffic signal on D Street and Silver Line Way in South Boston can be the bane of many a Silver Line commuter’s existence: Every morning, as the bus driver waits for the red light to turn green, riders may be stuck waiting for up to 100 seconds. When I recently wrote about Seaport gridlock and the area’s transit problems, I mentioned that the city had improved the signal, so that it would prioritize the Silver Line buses that cross D Street and those riders in the bus wouldn’t be caught in traffic as long. But a number of Silver Line regulars called foul: They said the red light was, indeed, still 100 seconds long and the morning wait at the stoplight was just as lengthy as ever. I checked in with the Boston Transportation Department and the MBTA to see why riders were still waiting at 100-second lights. Don Burgess, the senior traffic engineer at the Boston Transportation Department, said officials didn’t change the length of time that the light is red. Instead, they made it more likely for a bus to hit a green light. How does that work? Previously, the city had used detection software that would allow cars to continue moving along D Street until a bus on Silver Line Way, the cross street, was detected by the signal. The signal only detected the buses for a certain point during the cycle, however. That meant that there was a limited window for the signal to see that there was a bus waiting to cross — and sometimes buses would get stuck in the tunnel, missing the chance to get detected. If the timing was wrong, a Silver Line bus could come to a red light, not get detected, and the red light would start counting down another 100-second cycle immediately because it didn’t think there was a bus there. To help prioritize the buses, then, the transportation department now uses a regular cycle for a light. The green light will flash regardless of whether there’s a bus, which has helped improve trip time. A trip on the Silver Line was reduced between 15 and 27 seconds, according to preliminary data from the MBTA. Silver Line riders like Ari Ofsevit, however, think that’s not enough. Ofsevit, who works as a transportation planner in his day job, thinks it’s unacceptable that the red light is 100 seconds long, and that the MBTA isn’t using readily available detection software that would better prioritize the buses. City transportation officials say it’s not that simple: They point out that the signal has to fit into the timing of the other lights around it. 73%: The percentage of people who contacted the MBTA about proposed fare increases who had a negative feeling about them. And MBTA officials say they don’t want to cause even more traffic by taking away time that cars can move on D Street, a major artery of the area. “We’re trying to process the transit vehicles in the most effective way,” said Burgess. But Ofsevit said it makes absolute sense to start making sure mass transit gets a higher priority than regular traffic. “If the final result is that the buses move faster and the average person driving a car waits a few extra seconds, that’s a perfectly good tradeoff to me,” Ofsevit said. About 73 percent of the people who contacted the MBTA about proposed fare increases had a negative feeling about them, according to data released by the MBTA on Friday afternoon. The MBTA’s fiscal control board is currently considering two fare increase proposals: One could hike the average fare systemwide by 6.71 percent to bring in an additional $33.2 million annually, and the other could raise the average fares by 9.77 percent to raise $49.4 million. The MBTA held a public comment period from Jan. 8 to Feb. 12 and collected 8,105 responses. Some 4,850 of those responses included people using a tool on the website that compared their current fares with the possible new fares, while others submitted comments online, on the phone, through letters, or at public meetings. The report compiled by the MBTA showed that most people mentioned the quality of service when they responded. Some of those comments got pretty angry, according to some samples they provided: “You ask for more money, and are taking away some very important stops and can’t/won’t fix the problems like signal problems, always a signal problem, or switch problems. TRY MAKING CHANGES BEFORE YOU TAKE MORE OF OUR MONEY!!! !” read one comment. Others said they didn’t want the money to go to the MBTA’s “bloated payroll” and “outright abuse of overtime pay,” or that they worried that more people would stop taking the MBTA because of the increases. If you were planning to take advantage of the South Boston Bypass Road this week, you’ve missed your chance. Previously, the road was closed to noncommercial traffic. Last August, the state began testing what traffic would look like if all drivers could use the road. That six-month pilot program came to an end on Friday, and transportation officials are now looking into whether it would make sense to keep the road permanently open. State transportation officials say the initial data showed that opening up the road didn’t hurt traffic mobility in the Seaport. Volume increased about 21 percent in the eastbound direction of the temporarily opened road, which meant about 100 more vehicles used it during the morning rush hour. The state plans to fully document the data in a report this spring.